According to developer Nick Frey (via 9to5Mac) code within iOS 7 hints at a new upgraded processor, likely the A7 processor expected to be included with the iPhone 5S. 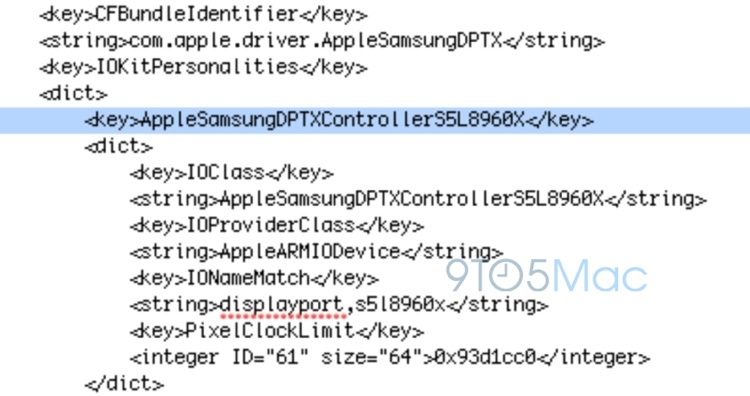 The code includes a reference to an s5L8960x application processor, which is a higher iteration than the s518950x and the s518955x numeration found on the A6 and A6X processors used in the iPhone 5 and the fourth generation iPad. As noted by 9to5Mac, it appears that the upcoming system-on-a-chip will include Samsung components. Interestingly, it appears that Apple will again work with Samsung for this new chip. The main system-on-a-chip will include some Samsung components- at least to power the display, according to analysis of the above code by a person familiar with Apple’s chip design process. This source also says that over the past couple of years, Apple has hit roadblocks (in relation to processing speed) with both the upcoming A7 and A8 chip, but it appears those that issues have been resolved. While the appearance of next generation Samsung components in iOS 7 confirms reports that Apple will stick with Samsung for its 2013 product line rather than switching exclusively to TSMC, it remains unclear whether or not TSMC is also involved in the chip production. A March rumor suggested that Apple might use both Samsung and TSMC to produce its 2013 chips, and a prototype iPhone 5S revealed a K1A0062 identifier on the main A7 chip, suggesting that it could potentially be manufactured by TSMC. Apple has been reportedly aiming to reduce its reliance on Samsung, and in June, the company signed a three year deal with TSMC that will see TSMC producing Apple’s A8 chips and potentially its A9/A9X chips as well. Apple did, however, backtrack and sign a second deal with Samsung that will see Samsung producing 14-nm chips for the company beginning in 2015, indicating that Apple plans to continue working with both companies. Will it include the Benchmark Booster code in iOS? She loves me, she loves me not. Repeat and rinse. Hoping it's a quad core CPU. With all the software optimizations that Apple can do, the iPhone 5S will be a true beast of a phone. RAM is a constant energy drain, they will increase the amount as necessary. More RAM may not be necessary right now. I'm still shocked Samsung would supply Apple with parts. Even though business is business, they lost $1 billion over some frivolous excuse. I'm pretty sure that it's illegal to discriminate against certain corporations when selling parts. In the end .. they just need each other. Exactly how I feel. I'm hoping for some extra RAM, especially since iOS 7 has new multitasking API's. But maybe because of all those software optimizations it will remain dual core. Does the next iPhone/iOS need a quad core processor? On one hand, the iPhone 5 runs smoothly, but on the other hand, it'd be odd for Apple to release a 2013 flagship phone with a dual core processor. Perhaps the 5S will be quad core while the 5C (or whatever) will be dual core. It probably will need a quad core to be honest. iOS 7 has proved to be more graphic intensive (on second thought, a quad core GPU rather than CPU) than 6 and I'm sure Apple will want it running its greatest on its new flagship phone. Plus, it's 2013 and dual core seems a bit outdated at this point. Usually S models introduce huge improvements in processing as well. That makes sense, 5S quad core, 5C dual core. Ha ha, get it from the experts eh. Maybe Samsung should sponsor a Tour de France team. I think it's more like Apple needs them more and Samsung is just willing to make more cash off Apple. It's pretty obvious that Apple hates Samsung so why give them more business. Because no one beside Samsung meet Apple's need? In both quality and quantity requirement. Quad core + 2GB = Take my Money!